My serene Monday afternoon yesterday was surprised by the visitation of three local immigration officers to our house. When I was in the midst of working on something in my room, my Mother-in-Law suddenly screamed my name and asked me to go downstairs immediately. She said, "Some government people are here to check your visa! I have called your husband to go home (from office) too." After the officers formally introduced themselves, my Mother-in-Law let them go inside our house. There were two male officers (one was carrying a DSLR camera) and one female officer carrying some document folders. Two of the officers did a brief interview on me in Bahasa Melayu and asked me to show them my marriage certificate and passport. The other one was busy taking photos of our house and me being interviewed in the living hall. The officers explained that they do this kind of random check on foreigners in Malaysia to verify whether their stated address, visa, etc.. are valid since half of the foreigners-with-staying-visa cases in Malaysia are often fraudulent. Actually, when my husband and I got my very first long-term spouse visa approval here about two years ago, we were once told that the local immigration office might do a spot check in the foreigner's residence on yearly basis just to make sure that their current paperwork is legit and they are not breaking any laws. For us, finally, that day came yesterday. Moving on, after the interview in the living room, the officers requested to see my bedroom upstairs! Three of them went up to my room and one of them took photos of my room, bed and wedding photos on the wall. They asked me to sit on my bed and took photo of me there, which honestly was too tall an order for me because at one point, this request made me feel like I was a criminal. However, they said it's their new procedure so we had to do it. What made me more embarrassed was the fact that I presented them with the sight of my underwear and newly bought nursing bras hanging to dry in my room when they came in yesterday and one of the officers made a joke about it to my Mother-in-Law. Oh well, how would I know that some strangers would be entering my bedroom yesterday? Next, we all went back to the living room downstairs and soon, my husband arrived home. The officers chatted with my husband and again, they took photos of my husband and me together in the living room, our marriage certificate and my passport as proofs. After that, they got no more further question for us and left our house. What an afternoon to start the week! I have lived in the Netherlands and Singapore for many years but never had a shocking inspection at home like yesterday. I guess Malaysia is just very different. Last but not least - for foreigners in Malaysia out there who happen to read this post, as long you can show the immigration officers your valid visa documents and passport during the spot check in your house, fret nothing. These guys are just doing their duties anyway. Yesterday, my husband suggested that I should bake a coffee cake after I asked him to give me some ideas of cakes that I could make on Friday. I found lots of wonderful coffee butter cake recipes in the internet but most of the recipes required walnuts, pecans, sour cream and yoghurt as part of the ingredients and I didn't have all those in my kitchen. In the end, to save my time, I decided to make a simple butter cake and incorporate instant coffee powder to flavour it. I adapted the Pandan Marble Butter Cake's recipe I baked the other day to make my version of simple coffee cake. I omitted the pandan juice from the recipe and replaced it with coffee mix. It worked! Mini marble coffee butter cakes. Beat eggs, sugar, flour, vanilla essence, ovalette and condensed milk by using high-speed electric mixer until the mixture is pale, fluffy and double in volume. Slowly drizzle the melted butter onto the cake batter and keep on whisking it by using slow-speed electric mixer until everything is just well combined. Dilute the coffee mix and cocoa powder with lukewarm water. Set aside. Divide the mixture into two equal portions. Add the coffee and cocoa powder mixture into one portion and mix well by using rubber spatula. Pour the white and chocolate/coffee cake batters alternately into a square baking pan already lined with parchment paper. Bake the cake at 150-160 degree Celsius in a preheated oven for about 45 minutes. Remove the cake from the oven and let it cool in the baking pan for about 5 minutes. Cut the cake to mini squares when it is completely cooled. A mini marble coffee cake square. Perfect for breakfast or tea time. My husband and I think that this version of coffee cakes were not disappointing at all. In fact, they tasted great, had soft texture and would make great companions for a cup of hot coffee, Milo or tea. The cakes' coffee aroma was so strong yet it's not bitter when eaten. However, I think these mini coffee cakes may not be suitable for kids' consumption as they contain caffeine. ** Get the printable version of this recipe HERE. A couple weeks ago, I shared that my Gynae gave me a paper with tables and asked me to start counting my baby's movements every day, almost on hourly basis, after my pregnancy hit its 30th week gestation period. I am now about 31 weeks pregnant and have only started keeping track of my baby's movements in less than a week ago because I was so lazy to start this. My Gynae explained that the goal of this chart is to make sure that the baby makes recognizable movements at least 10 times in 12 hours. The movements may include the baby's kicks, punches, rolls, stretching or hiccups. Once the baby moves for about 10 times, I tick the chart according to the time when the baby moves. I need to make sure that the baby moves regularly. to track my baby's movements. Anyhow, I have been doing what my Gynae told me about charting the baby's movements, although I feel that it's a very tedious task, for my unborn baby's well-being' sake and because the Gynae may ask for this marked chart on my next prenatal visit. I hope I am working on this chart in the right way. ** On a separate note, please be aware that different health practitioner may give us different method in counting the foetal movements so consult with your Gynae about his/her protocol in performing baby kick counts. I did some blog hopping few days ago and stumbled into a pretty established baking blog. One of the recipes there caught my eyes and I was so tempted to try one of the author's cake recipes, Pandan Marble Cake. Her Pandan Marble Cake looks so pretty (with perfect marble effect) and very soft too. I had all the required ingredients needed in the kitchen so I tested the recipe yesterday afternoon. I used half of the ingredients stated in the original recipe and instead of using artificial pandan essence, I squeezed smashed pandan leaves from our garden to get some fresh pandan juice. Here's the version of the recipe that I used yesterday to make the butter cake. Pandan Marble Butter Cake cut in mini squares. Divide the mixture into two equal portions. Add pandan paste/juice and green food colouring into one portion and mix well by using rubber spatula. Pour the white and green cake batters alternately into a square baking pan already lined with parchment paper. Remove the cake from oven and let it cool in the baking pan for about 5 minutes. Perfect companion for a cup of hot Milo. tea or coffee. The smell of the condensed milk and butter when mixed into the cake batter was so good and I knew that this cake would be everyone's favourite. As for the verdict of the cake's final result - I personally loved the very soft texture of this cake and won't hesitate to try making it again, probably with different flavour and colour for variation. I cut my cake into mini squares for easy consumption and they were all gone by this morning. Two weekends ago, I was so eager to eat Kolak, a type of Indonesian dessert, that my Mom usually prepares for us back home. Since I happened to see that my Mother-in-Law had three ripe large bananas (or specifically called Horn Bananas/Pisang Tanduk) in the kitchen, I asked one from her. This large banana is one of the key ingredients in making Kolak, without which I think the dessert would taste incomplete and plain. Making Kolak is relatively easy. However, since I have not made this dessert by myself since many years ago, I had to ask my Mom in Indonesia to teach me how to do it properly. Apparently, tutorials via international text messages were not so clear to me and I made minor mistakes in the orders of boiling all the ingredients. Nevertheless, in the end, everything turned pretty fine and Kolak's taste was well-accepted by Malaysians' palates. Since my husband's family here in Malaysia had no knowledge about this dessert, I introduced Kolak as Indonesian style sweet soup/tang shui. It is easier to use this term when they asked me, "What are you cooking?". Please note that the ingredients stated below are just my rough estimates. I did not really measure the exact ingredients so strictly when making sweet dessert like Kolak so just play around with the amount of the ingredients as long as you feel there's balance of everything (ingredients and the sweet coconut soup). Also, the tutorials below state the right orders in boiling all the ingredients, as per my Mom's classic recipe. My first Kolak in Malaysia. When preparing the coconut milk, separate the first squeeze of the coconut milk to produce thick coconut milk (santan kental). Set this aside. Keep squeezing the grated coconut to produce the thin coconut milk (santan cair) to boil the ingredients and create the Kolak soup. In a large pan, pour all the thin coconut milk together with pandan leaves, vanilla extract, chopped cassava, sweet potato and pumpkin. Cook until half tender. Add the chopped banana onto the Kolak. When the banana and the rest of the ingredients are almost done, add sugar as needed. Stir well. Pour the chopped jack fruit. This addition will make the whole dessert tastes more fragrant but some people may not like the taste or smell of jack fruit. Lastly, add the thick coconut milk into Kolak and bring it to boil. Turn off the stove. Serve warm. For overnight keep, don't forget to refrigerate Kolak. This dessert is easy to make, right? It can be eaten warm or cold. One thing though, I must say finding the ingredients here in Malaysia was not so easy. I could not find cassava in local supermarkets and had to ask my Mother-in-Law to find any for me when she went to the wet market in town. Fresh jack fruit in Malaysia is quite pricey too. Since I fell pregnant about seven months ago, I have heard and pretty much collected lots of pregnancy myths and old wives’ tales, wrapped in the form of advices, from my family, relatives and friends. They meant well by telling me all those advices but somehow I don't exactly follow or believe most of them as I understand that their claims are not medically or scientifically proven. If they were true, to some degree, my Gynae herself would have informed me those advices too, yes? Pregnant? They say no more cold desserts please. Here’s the quick compilation of more than a dozen pregnancy myths and old wives’ tales that I have received by far. Expecting mothers with sharp-looking tummy usually carry boys. Those with round-looking tummy usually carry girls. My take: My mother once noticed that my pregnant tummy is not that round and guessed that maybe the first ultrasound scan that predicted my baby's gender was not 100% correct. After the second ultrasound scan that confirmed my baby’s gender one more time, I am indeed still carrying a girl. Expecting mothers who crave and tend to eat more fish are likely to carry baby girls. Those women who crave and eat more meat during their pregnancy usually carry baby boys. My take: I refused eating fish during my first tri-semester. My Mother-in-Law was in good faith that I was indeed expecting a boy. The ultrasound scan, again, gave us the opposite news. It’s a pink. A pregnant woman is not supposed to lift their arms for too long (as when we hang clothes on a clothes line) or she’d make her baby’s neck wrapped by his/her umbilical cord. My take: During the antenatal class that I attended last month, my Gynae shared that unborn baby moves all the time inside the uterus and we can’t really control how he/she moves around and plays with the umbilical cord in the womb. A bumpy car ride may cause a pregnant woman to go into labour or experience early contractions. My take: To my knowledge, unborn baby is protected by amniotic fluid in the uterus so he/she won’t feel any bumpy rides/sensations - albeit bumpy rides may be uncomfortable for the mother. We, however, shall avoid riding roller-coasters at all cost when pregnant. Pregnant women should drink Korean Ginseng Tea during their first tri-semester so they'd give birth to active babies. My take: I was recommended to drink this ginseng tea during my early pregnancy but I blatantly said no. I was and am not keen in consuming certain herbal remedies or concoctions during my pregnancy due to potential adverse effects on my baby and me, as they are generally not prescribed by doctors. Don’t over-consume ice creams, cold drinks/desserts and Chinese cooling herbal tea/liang cha while pregnant as they’d make the mother’s uterus cold. My take: I try not to consume too much cold drinks mostly because I don’t want to have sore throat or runny nose, which is miserable, during pregnancy. Drink more coconut water while pregnant to promote smooth delivery and baby’s fair complexion. My take: Fair complexion is genetic, I think. I enjoy drinking coconut water simply because it tastes nice and refreshing. Pregnant women should drink a lot of soya milk and eat bird nest soup so they can have babies with good complexion. My take: I was once advised by doctor in Singapore not to drink too much soya milk or eat other fermented soy products because they possess high estrogen level and may cause hormones imbalance, like what I experienced before. I do drink soya milk once in a while though. As for bird nest, they are way too expensive for me to consume on a regular basis. Don’t eat too much watermelon or oranges when expecting a baby, or else when the baby is born his/her throat will be very phlegmy. My take: From what I read, watermelon dehydrates and contains lots of vitamins and antioxidant. Orange is also one of natural sources for vitamin C. Why not eating them? Don’t eat too much eggplant when pregnant, otherwise your baby will grow up having black teeth. My take: I don’t like eating eggplant so I don’t sweat so much about this. Pregnant women should eat more beans or peanuts so the baby would emerge from the womb sporting thick locks. My take: I think, at this stage, anything related to baby’s hair is genetic. Nevertheless, I guess it is no harm to consume beans or peanuts when pregnant as they possess nutritional benefits too. Don't eat too much kangkong as this vegetable will make pregnant mothers’ legs numb. My take: Don't know. Is it? Expectant mothers should reduce their intake on chilli or sambal or they'd make the baby's skin very sensitive and eventually, his/her skin will be prone to scarring. My take: I limit my consumption of hot and spicy food to avoid indigestion and heartburn. In conclusion, when in comes to predicting the baby's gender, take my word - there is nothing more convincing than Gynae's ultrasound scan result. Also, I don’t really adopt advices on don’t drink this or don’t eat that/drink more of this and eat more of that during pregnancy. I believe pregnant women can eat anything (except food with high caffeine content, raw meat/fish or high-MSG content food, for example) but the key here is always eat and drink in moderation. To top it off, my Gynae never told me to refrain from eating specific food or dishes as long as I know that I would not be eating food that may give me food poisoning, diarrhoea, indigestion, heartburn, sore throat or runny nose. Last but not least, any of the above pregnancy myths and old wives’ tales you’ve heard before? Or do you have anything else to add to the list? A couple months ago, I have finally started living the role that I thought would not be playing so soon – a full time staying-at-home-wife (and soon-to-be Mom, for the time being). I knew that this phase will eventually happen to me but I thought it would come much later. Another life transition for me. When I was younger, I have never envisaged the likelihood of assuming housewife title in my adult life. I was raised in an environment where married women with children somehow still managed to earn money and make significant financial contribution to their households while raising their children at the same time. My own grandmothers and mother are the perfect instances for this. I thought I could do the same. My then grand visions (post-school graduation) were working in an office located in one of high-rise buildings in a metropolitan city, wearing business suit for work every day, doing OT as part of the job, travelling overseas for business trips, meeting high-profile individuals from around the world, becoming the company’s top performer, hitting my bonus target as often as I could, etc. Basically, leading eventful working life and becoming a true career woman, which I ultimately did when I lived in Singapore for 4 years. Married life and family life after marriage didn’t really come into the picture so vividly. Who knew when I found my better half, I was willing to shatter all my dreams and voluntarily trade all the above to this entity called, (building) a family in a total new place? From a full time working executive in Singapore, I turned to a freelancer in Malaysia (when I first moved here until recently) and now slowly adjusting my life to fit a role as a full-time staying-at-home-wife and mother when my baby arrives. Why becoming a stay-at-home- wife/mother? My decision to becoming a full time housewife is a well thought and discussed choice. Other than the fact that it is challenging for me to find a suitable full-time job in a place where I reside now and working in an office out of town every day is out of question; my husband and I agree that we both want to be around our child as much as possible after she is born. I understand that being good parents is not an easy job and there is undeniably a lot of learning for my husband and I to do, but I’d very much love to watch our baby grow up in my care, particularly during her pivotal first few years. We have alternatives to hire nanny’s or day care’s services out there to look after our baby, but we have ruled this option out. We could even probably ask our parents to raise our baby, like what many young working parents in the current economy view as the most feasible and safest option – so both parents can continue earn a living. However, I don’t really want to miss my baby’s development milestones and personally don’t quite like the latter idea of having our parents (i.e. my parents and/or my husband’s parents) taking up the role as our child’s parents due to various reasons below. I think our parents have done their fair share in, to name a few, changing diapers, feeding babies, tending sick babies, checking in babies to clinics for their regular immunizations or enduring interrupted sleeps at night to calm crying babies - when they had us. Therefore, I consider it is only appropriate to let them enjoy their golden years by not doing those taxing child/baby-raising tasks in an extended period. I mean it is all right to rope in our parents' assistance to look after our child once in a while (and I am sure they’d be delighted to do it) but not every day, for few consecutive years. I want my child to have strong bond with us, her parents. I feel that the style and method in raising and educating children done by our parents’ generation maybe different from ours. This may promote unnecessary miscommunication or misunderstanding disputes between us and our parents – and we’d like to avoid those, especially since they are doing the favour in helping us raise our child. In most cases, I learnt that grandparents tend to over-spoil their grandchildren. This kind of upbringing can be quite a conflict of interest for me so I presume it’s better if my husband and I keep a healthy level of child spoiling business by raising our child on our own. Another reason, my husband is not a believer in keeping a domestic helper in our home. He just doesn’t like the feeling of having a stranger stay in our home, with us. Hence, while one parent (husband) works hard to keep the household going, then the other parent (wife) has to do the job in raising the child and running the family’s home – even though this path maybe monetarily burdening. Once my baby grows a bit older, nonetheless, I still hope to take any freelance projects that I deem doable from being completed at home (like what I have been doing before) to keep my brain sharp, active and up-to-date. What happens during the transition of becoming a stay-at-home- wife/mother? Much less income and no financial independence (for the woman). With full time job, clearly I did not have to worry about receiving steady income. With part-time job, although I could not ensure getting my payment regularly, I still earned my own money somehow. With no job at all, I receive nothing and have to try not to touch my personal savings, unless for emergencies. No more luxury. I can’t do crazy impulsive shopping spree any more. I am not supposed to be so picky in eating my favourite food outside either. Since I currently still live with the in-laws, whatever my Mother-in-Law serves on the eating table, like it or not, I eat them. Boredom. Suddenly, I have so much free time on my own now. After I am done with the house chores, I get to entertain myself doing all the stuff I enjoy such as blogging and baking. That’s why I have lots of baking posts in my blog these days. On some days, however, I get tired of dating myself all day long and don’t know what else I could do since my husband told me not to sweat about monetizing my hobbies at the moment. Less confidence. Sometimes I feel insecure with how other people may view my current life as an unemployed woman, a full time housewife. I don’t know how much my own market worth should I get back to the working world in the near future. Am I wasting my double degree now? Incomparable satisfaction in accomplishing day-to-day domesticity versus having a career outside. These two are not the same, apparently. Paradigm shifts. I have to remind myself over and over again on why I am doing all this or living this current state of life. Yep, I am in practice of becoming a domestic goddess and trying to embrace my new status wholeheartedly. Whilst waiting for our baby’s arrival in September, I try to soak every (boring and relaxing) moment I have now and treat this quiet period as a privilege for a pregnant woman. Sometimes I do miss my previous busy working life (and the receiving my routine salary part) but life has changed now as our family is expanding. Transition is always hard especially in the beginning but I will get past this as I know I’d be one busy woman again, receiving the unseen dollars as my monthly salary, once my little one has come to this world. Another new chapter of life is indeed waiting for me. I am going with the flow. There were few times when we went to local supermarket, my husband pointed Scottish Shortbread for me to make. I just replied him with "OK" many times but never actually realized his suggestion until last weekend. I ran out of idea what cookies or cake to bake, so I started searching for Scottish Shortbread recipes in the internet. After reading the reviews, I decided to go ahead with the Scottish Shortbread recipe from this source. In the beginning, I could not believe that making basic shortbread would only need three ingredients for the dough. Since I had the entire required ingredients ready in my kitchen, I gave this recipe a shot. However, I only made 1/3 of the stated ingredients from the original recipe to test this recipe and added a bit of milk powder and vanilla extract to the dough. Here's my shortbread recipe version. My first trial of Scottish Shortbread. Cream butter, vanilla powder/extract and sugar by using electric mixer. Add 150gr of flour and milk powder to the mixture. Mix well by using rubber spatula. Sprinkle kneading board with the remaining flour. Knead the dough for 5 minutes with the remaining flour until it forms soft dough. Make a ball from the dough and cover it with plastic wrap. Refrigerate the dough for 1 hour or overnight. Roll the dough to 1/2 inch thickness and cut them into 3x1 inch strips. Prick the cut shortbread dough with fork and place them on a pan already lined with ungreased parchment paper. Sprinkle the shortbread with a little bit of brown sugar before baking (optional). Bake the shortbread in a preheated oven (at 150 degree Celcius) for 20-25 minutes. My husband and I think that the shortbread I baked tasted more like plain butter cookies but they had really crumbly, almost melt-in-mouth, texture when eaten. My mistake in my first trial here was probably the final presentation of the shortbread I made. I should have rolled the shortbread dough a bit thicker so my shortbread would look more like shortbread fingers than square butter cookies. My husband took this following photo of mine yesterday evening, just before we headed to a nearby restaurant in town for his friend's wedding dinner. I already applied some make up on my face and wore my new maternity dress for the party, so why not snap my latest pregnancy picture as well? 29 weeks and 3 days pregnant and already gained 12kg. Yes, I am large now. Also, I rub my belly all the time! My husband and I just came back from my 7th month antenatal visit. We waited for about 3 hours in the hospital this morning just to see the Gynae and honestly, we both almost fell asleep in the hospital while waiting for our turn. Enough with the queueing rants - as usual, once we saw the Gynae earlier today, she asked me about the pregnancy symptoms that I felt in the past month. I told her that I have recently been having stomach discomforts after eating. She replied that this is likely due to indigestion problem but no medication needed. Next, I stated that my joint pains on my right buttock and upper thigh are still there. She commented that these are because my joints are getting loose due to my pregnancy plus it seems like I have not been really maintaining good posture on my daily life as I tend to put extra weight on my right leg when standing up. Unfortunately, she emphasized, as my baby grows bigger, the pains will get even worse and she recommended the same thing to ease the pains - compressing the painful area with warm water bag. Also, I shared with her that these days I have been having visual disturbances of seeing ' little stars' when I stand up after I sit down or sleep. My Gynae assured me that there is nothing wrong with my current blood pressure and these 'little stars' happened to me as my blood circulation flows more to my lower body parts or legs. As for this one, she advised me to take my sweet time when getting up from sitting or sleeping position. The last thing that I mentioned about my pregnancy discomforts was the super frequent urination that I have to go through in the past few weeks. The frequency is just awful and I literally can't stay far away from toilets. Again, she said, it is the baby. The baby has been pressuring my bladder so I get to pee more often than usual. After the above brief consultation, here comes the most exciting part of every antenatal visit. The ultrasound scan! My Gynae explained that based on the scan, my baby is doing fine and moves very actively. So far, I have enough amniotic fluid in my uterus to keep her comfortable and my placenta is in a good position too. There is no sign of early birth as of now. The highlight of today's scan was probably the fact that we got to see my baby throwing her killer smile to the four of us (my Gynae, her nurse, my husband and me) during the 4D ultrasound scan. My Gynae said that it's a very rare occasion to notice a baby smiling from the womb! Sadly, though, my husband and I didn't get the print-out of her face when she was smiling to us. My baby girl at 29 weeks and 4 days: Looking chubbier each day. Just before we concluded our antenatal visit today, my Gynae passed me a paper with tables that I should fill out on hourly basis every day after my pregnancy hits its 30th week. The paper is actually a kick-count chart using Cardiff Count to Ten method to keep track of my baby movements. I have to make sure that my baby makes movements (kicks and hiccups) at least 10 times a day. Any number lesser than that on a particular day, then I am supposed to see my Gynae on that same day to make sure everything is okay with my baby. Last but not least, before we headed home, I was given my second dose of (last) anti-tetanus shot. I mentioned to my Gynae that after the first injection last month, my left arm was so sore for a week, instead of a day, and I felt feverish for two days as well. She suggested me do my second anti-tetanus jab on my buttock rather than on my arm. However, when I saw the nurse was going to use a bigger needle for the jab on my buttock, I completely chickened out. I asked her to just use the small syringe with small needle and do the injection on my left arm like last month. Next month, I am scheduled to have a Full Blood Count (FBC) test when I see my Gynae - not sure for what just yet. Once my pregnancy hit 8 months of gestation period, I will then have to see my Gynae on bi-weekly basis. How great is that? I get to see my unborn baby every two weeks' time via the ultrasound scan to monitor her developments more closely - although this will probably mean more money that Daddy needs to spend in a month for the Gynae's visits. As for my pregnancy weight, I have put on 12 kg in total by now. I can't do anything much about my weight gain until I give birth. Therefore, in the meantime, I just have to calmly watch my weight go up, up and up for the sake of a healthy baby. Doctor bills: RM 148.50 (for the Gynae's consultation fee, urine laboratory test, anti-tetanus injection, multivitamins and fish oil capsules). I consider baking muffins as a very tricky business. After so many trials, I still feel that I have not had the hang of it. By right, whipping the muffin batter should be relatively easier than making any other cake batter but somehow, I still had not done that quite right. To me, ideal muffin final results would be those that rise tall (not flat) when baked, have slightly cracking dome shape tops, posses soft (not dry) texture in the inside and taste great when eaten. This afternoon, I tried baking muffins again - mainly because I wanted to use up the coconut jam or kaya spread leftover that my husband bought a couple months ago and it was going to expire tomorrow. I browsed some nice looking kaya muffins' photos and recipes in the internet for few minutes earlier today and finally, went ahead with trying the one here because the photos of her kaya muffins' final results look perfect enough to me. I slightly modified her original recipe here and there as I didn't want to produce very sweet muffins and find that muffins that are baked with the absence of butter don't taste so nice. Hence, I included some melted butter in the muffins' wet ingredients mixture. Here's the (half) recipe that I used today to make my kaya muffins. My version of Kaya Muffins. Mix together sifted flour with sugar. Set aside. Combine egg, milk, melted butter, oil and vanilla extract in a large bowl by using wooden spoon or balloon whisk. Pour the wet mixture to the dry mixture. Stir gently until just combined, do not over-mix. It is okay to have the muffin batter with some lumps. Spoon 1/3 of the muffin batter into the prepared muffin pans/cups already lined with muffin cases. Put 1-2 tsp kaya spread in the middle of each muffin cup, then put more muffin batter to fill about 80% of the muffin cups. Bake the muffins in a preheated oven for about 25-40 minutes, depending on the size of the muffin pans/cups used. Once done, leave the muffins in the pans/cups for 5 minutes then serve warm or transfer to a wire rack and leave to cool. ** To serve the muffins warm, put the cold muffins in the microwave for about 20 seconds. The inside of the Kaya Muffins I made today. The above recipe makes about 3-4 large muffins. I think I put too much muffin batter in each muffin cup whilst I could have made 4 muffins from the above recipe today. Anyway, in the end, they tasted really great (buttery, fragrant, not too sweet and soft like a cake, even my Mother-in-Law agreed with me on this) especially when eaten warm - otherwise I would not dare to post the photos and recipe for public reading here. Yet, I think I didn't do so well in creating the nice muffin presentation that rises tall and has dome shape tops, like I wanted. Attention! These are not dog food. I made these cute butter cookies in dog shape (for human consumption) this morning utilizing some baking ingredients that have been stuck inside my kitchen cabinet for too long and I think they were going to expire soon. First trial: Cute little cookies ready to be baked. Happy, sad, angry, fierce, sleepy looking dog faces. A batch of dog shaped crunchy cookies ready to munch. Aren't they adorable? My husband said they tasted not 'boring'.. Hmm, that means the man liked them. My Mother-in-Law told me to spare some of these cookies for my nephews and nieces because the dog shape of these cookies would definitely fascinate the kids. Just an update - when my younger nephew came by our house earlier this morning, he ended up playing puppets with the cookies before eating them. Surprise, surprise in early July! A fellow blogger just nominated me again for another blog award. 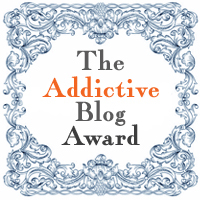 Emma, the author of Food, Fork and Good has passed me the Addictive Blog Award last night. Thank you so much, Emma, for the privilege. Emma currently lives in the UK and she shares tons of delicious recipes in her blog and that I think you should check them out. To comply with the second rule, here's a little background of my (constant) appearance in the blogosphere. Some of you might have read the history of this blog in my site's About Me section. Anyhow, I'm laying out the story again - as requested. I first started my blog in late 2008 and was inspired by some journalist/professional writer friends in Singapore who already blogged for many years. In summary, I thought of creating my very own blog by journaling whatever things in life that interest me. Recently, besides journaling my personal life, I have been blogging quite a lot about baking - my old flame and a hobby that I have nurtured since I was 12. I keep all the photos and recipes of my bakes in my blog so I have organized paper-free records of them and could share them with others who happen to have the same passion with me. Having more and more blog readers, receiving more comments on each post that I write, connecting with other fellow bloggers from around the globe and being honoured with blog awards (like this one, for instance) are the main reasons why I relentlessly keep on blogging until this very day (unless when I am ill, too flat out to type words on my laptop, extremely busy with other things on earth or have no internet connection, of course!). Are you sleeping already? OK, so let's call the history lesson a day and move on with nominating 10 blogs that I think are addictive. It is not easy to short-list another 10 favourite blogs of mine while I just nominated 15 fantastic blogs last week when I received the Versatile Blogger Award. Therefore, I think I would have to select some of them again for this one. Most of the above names are highly recognized avid bloggers in the region (or perhaps in the whole world, for that matter) who have been devoting so much of their time and energy in maintaining their informative and entertaining blog contents regularly. I have personally followed their blog updates for quite some time by now so I guess it's only proper if I regard their blogs as addictive (for me) to follow. Thank you again, Emma, for the award! A couple days ago, I came across Bing's post on making chocolate chip cookies and was immediately intrigued to try her recipe again. Yesterday afternoon, I asked my husband if he was in the mood of munching some cookies that are similar to Subway's (re: slightly chewy, fragrant, buttery and sweet) and he said "Yes!". Shortly, I tested Bing's latest recipe for my Sunday's baking. As usual, for my first trial baking attempt, I only made half of the ingredients from indicated recipe. I used chopped cooking chocolate instead of chocolate chips. Also, instead of making the cookies in a size as big as Bing's or Subway's, I made the cookies in a bite size as per my husband's request. Below is the (half) recipe I used for making chocolate oatmeal cookies yesterday. The buttery cookies smelled really heavenly when baked in the oven. The whole kitchen smelled so wonderful and all of sudden, the cookies' aroma gave me that blissful Christmas feeling. The first batch of my Chocolate Oatmeal Cookies. 1. In a large mixing bowl, add flour, caster sugar, brown sugar, oatmeal, milk powder, baking powder and salt. Stir all these dry ingredients until well combined. Set aside. 2. In another bowl, mix together butter, vanilla extract and egg by using a balloon whisk. Don't worry so much about the lumps. Then, add the vegetable oil into this wet mixture and mix well. Whisk the wet ingredients until well combined. 3. Make a well on the dry ingredients mixture then add the wet ingredients into it. Stir well by using a rubber spatula. Combine the wet and dry ingredients to form cookie dough. 4. When the dough is ready and not sticky to the bowl, add the chopped cooking chocolate. Combine well. Add the chopped cooking chocolate to the cookie dough. 5. Roll the dough into equal size balls and put them in a tray which is already lined with parchment paper. No need to press the cookie balls as they will melt in the oven's heat. Roll the cookie dough into small balls. 6. Bake the cookies in a preheated oven for about 15 minutes. Be careful not to burn the cookies' bottom. Cookies: Fresh from the oven. 7. Remove the cookies from the tray and let them cool. The cookies will be a bit hardened when they are cool. Chocolate oatmeal cookies ready to serve. ** This recipe makes about 40 small cookies. In my opinion, making these cookies is relatively easy and simple yet the cookies' final results were pretty great. In addition, this recipe requires minimum baking utensils to prepare the cookies dough (no need electric mixer! ); hence less stuff to clean or wash after baking. Children would definitely find these cookies a treat. My husband and I sent half of the cookies I baked to my nephews last night. My eldest nephew thought we bought these cookies from some shop outside and my husband brought some of these cookies to his office for snack this morning.